When You Get Dumped On | Kierra Raine and Co. Sometimes life just rains on you and you have no choice but to take the drenching. On Friday, I helped Steve on his lawn route. Our plan was to quickly whip through them and have a relaxing evening at home and leave early the next morning for Glacier for a refreshing weekend of camping. It was raining when we woke up but the blue sky toward the east looked promising. We packed Sky and Kobe into the jeep with some snacks and toys and after a bit of tying loose ends up we got started. The rain wouldn’t stop. In fact, it got harder. I mowed while Steve trimmed. We got wet. Very wet. But we finished that lawn and moved on to another. This time, Steve used our smaller push mower on the wettest part of the lawn so we wouldn’t leave ruts. I used the big one on the level part. I mowed over a dead bird. It stank. And the mower clogged with wet grass. I had to stop and unclog it. Now if you’ve never unclogged a mower you are lucky. Its discusting and gross and filthy. Not to mention the dead bird. I was afraid I would encounter guts or a leg. Shivers. It was still raining. Every time we decided to stop, the rain would slow or let up and the sun would shine in the blue sky. So we would keep mowing. And more rain would whip through. Just when I had dried off and warmed up, the heavens would open and rain would pelt again. We thought about the fun weekend we had planned. We were already wet and dirty and it wasn’t worth stopping, so we slogged along. The mower overheatedwhen the cotton wood trees’ cotton clogged the filter. We had to blow it out. Kobe was grouchy. By evening we were exhausted but had only one more lawn to do. It was a big one but is usually a fun mow. So we girded up the loins of our minds and got to work. I saw a huge dark cloud covering a few miles radius overhead but I thought I could quickly finish. It started to drench again and I knew I would cry if I didn’t make a joke out of it. So I pretended Kierra was in Heaven with a squirt gun, spraying me down for the third time. That helped. But a half hour later, it wasn’t funny anymore. My hands were freezing. I was soaking and the cloud looked worse. It was raining steady and cool and strong and I just wanted to be DONE. Then it rained harder and harder and suddenly i knew without a doubt that it would hail. I parked the mower and leaped off and ran as fast as my freezing wet legs would take me. 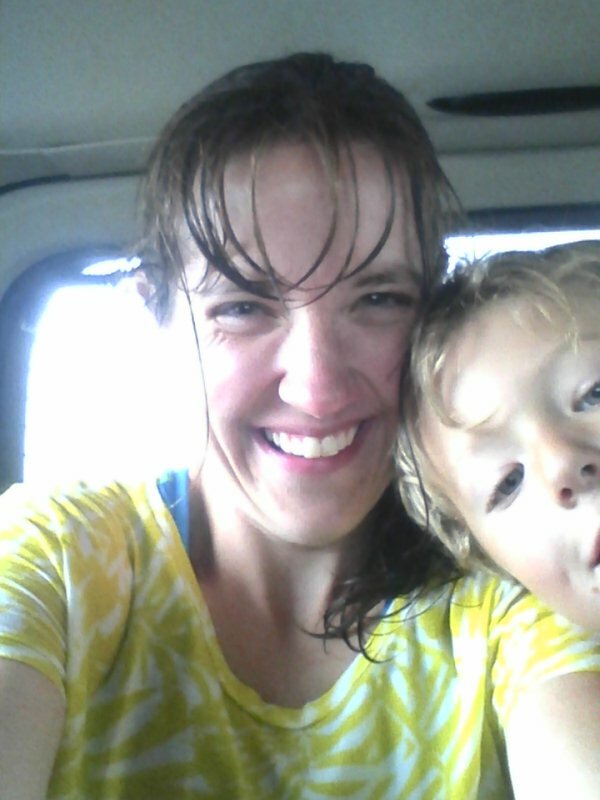 By the time I got to the jeep it was pelting hail and rain and the wind was breathtaking. I launched into the front seat as the torrential downpour outdid itself by another whole new level. Kobe and I hunkered in the back and laughed as the whole vehicle shook. Because that’s all we could do. We couldn’t finish mowing since there was streams of water rushing where there had been dry ground. We went home and warmed up and slept like crazy. This morning Steve finished mowing and a bit before lunch time we left for Glacier. They say it snowed there yesterday. We are hoping for the best and that the weather truly will warm up as predicted! It may be raining on our parade but that doesn’t mean we can’t choose joy and love the blue sky and Sunshine that’s warming the west today. No matter what life dumps on you this weekend….your not alone! I had to apologize to my little guy last night for my impatience. Today is new and fresh and we are focusing on here and now and a road trip. No rain storm lasts forever! There is always now to choose to trust and love and singing in the rain.